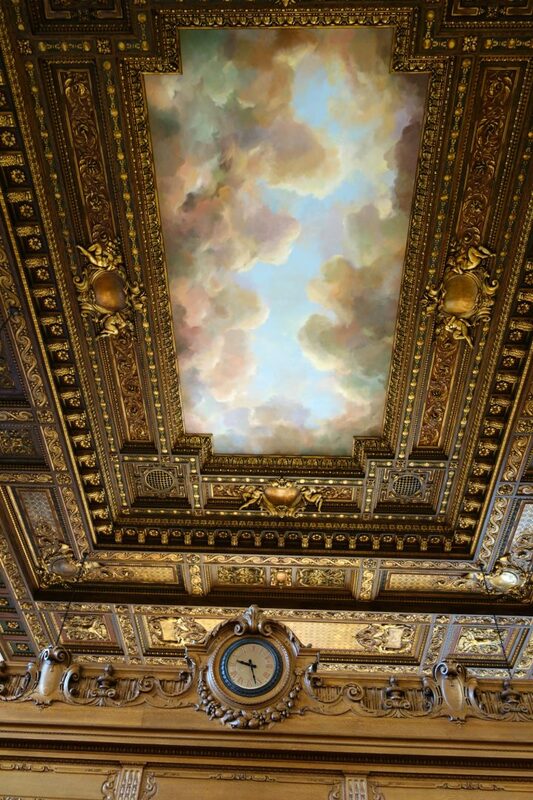 The central space of the Stephen A. Schwarzman Building had been closed for repairs after one of the plaster rosettes on its ceiling plummeted to the ground in May 2014. 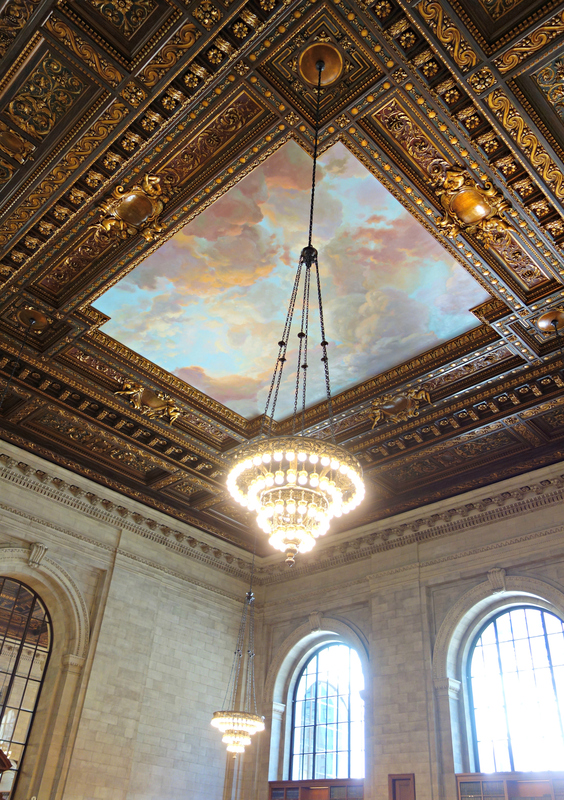 After two years of such meticulous attention to the space — which opened in 1911, at the same time as the rest of the main branch of the NYPL — the Rose Main Reading Room began welcoming the public again this morning. Its long tables adorned with evenly spaced lamps were soon populated by researchers, writers, and others who have used the room daily over the decades. “At a moment when we live too much in gated communities, the library is one place we all gather together,” Marx said. 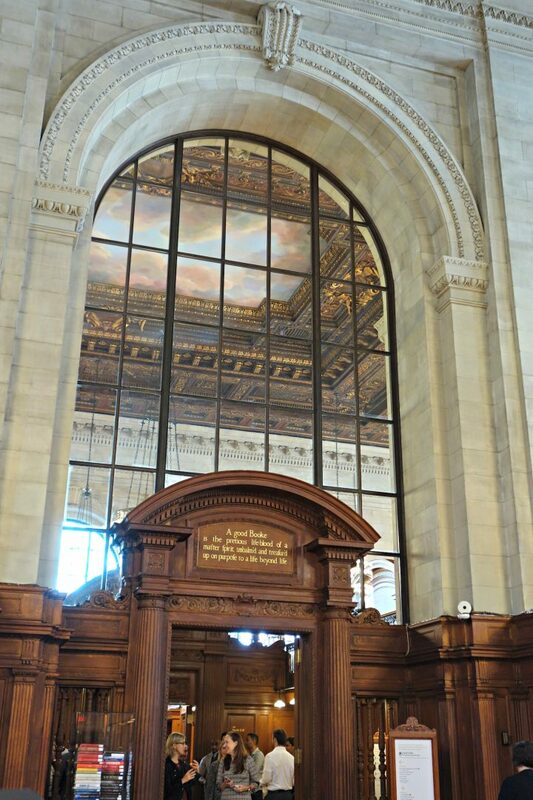 The Rose Main Reading Room stretches over a space equal to two city blocks, with a 52-foot-high ceiling. Now reopened, it acts as a portal to the massive trove of volumes in the library. The new Milstein Research Stacks below Bryant Park support a capacity of 4.3 million books, which means many research requests can be fulfilled almost immediately on-site, with tomes arriving at the center of the Reading Room on the brand new “book train” conveyor system. All the remarks at the Reading Room ceremony emphasized the books just as much as the community space — an important message after the dropping of a proposed, controversial renovation that would have favored a tech-heavy user experience and spaces out of sync with the historic aesthetic of the building. The $12 million restoration included securing 900 plaster elements on the ceiling with steel cables (invisible to visitors below). And until it closes this Sunday, October 9, you can see the fateful fallen rosette in the nearby exhibition Preserving a Masterpiece: From Soaring Ceilings to Subterranean Storage. Along with the Reading Room, the adjacent Bill Blass Public Catalog Room also reopened today. 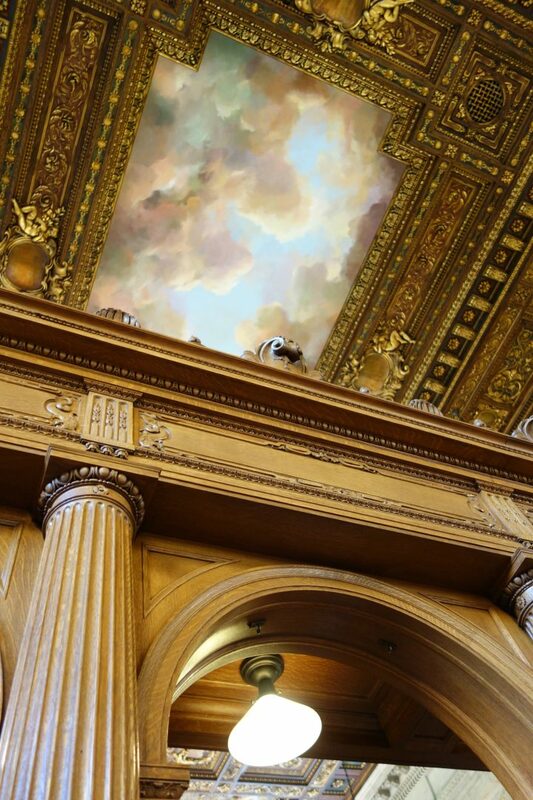 Its cloudy ceiling mural now mirrors those of the Reading Room, thanks to a re-creation of the original by EverGreene Architectural Arts; the original mural by James Wall Finn was deemed beyond repair due to decades of decay and bad overpainting. In both rooms, the murals are illuminated by chandeliers newly fitted with LED lights, improvements that still adhere to the 1911 intentions of architects John Merven Carrère and Thomas Hastings. 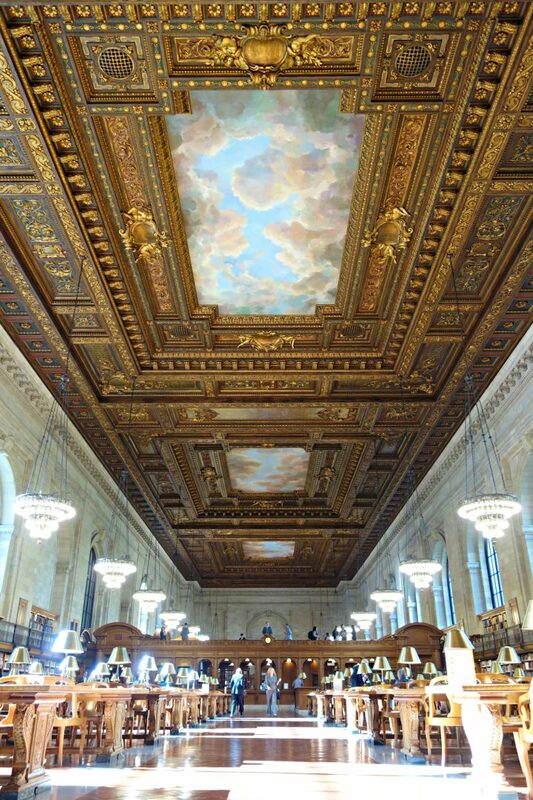 The Rose Main Reading Room is now open at the New York Public Library’s Stephen A. Schwarzman Building on Fifth Avenue and 42nd Street (Midtown, Manhattan).